There were times when the Japanese electronic giants like Sony, National and Panasonic dominated the world markets. No one accepted anything other than the leading Japanese brands, no matter how durable brands form other countries were. Even I was a staunch proponent of the Japanese electronic and never look an other direction when buying TV, refrigerators or even kitchen machines except the Japanese leading brands. But then things started to change. With the Japanese brands being sublet and other countries got licences to assemble and then completely manufacture the Japanese brands, customers lost confidence in these as the quality started to deteriorate. And customers started to look the other way. And it was the time when the South Korean companies stepped into the world of electronics with their brands. Although these were not accepted over the Japanese fading brands initially, but their quality soon changed the customer's mood and buying trends. Now if you look around, you would hardly find any Japanese brands like Panasonic, Toshiba or National. Even Sony is losing shelves in the showrooms and in its stead we find Korean electronics from Samsung and LG filling in the shelves. Although, Sony TVs are still visible, they are no match to Korean brands, which customers generally prefer. Other than TV, it is all Korean stuff that one comes across in the markets. 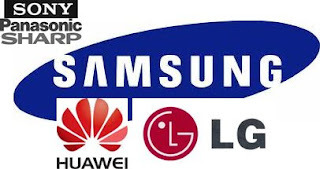 The complete dominance of the smartphone market by Samsung, specially in Asian markets and to a large extent in the European and American markets, is the rising trend. Although apple's iPhone occupies a major market in the USA, it is very vigorously contested by Samsung. Recent reports and market share show dwindling apple popularity and its market share coming down rapidly, overtaken by Samsung. The Sony Xperia has yet to make a mark in the smartphone market and challenge its Korean counterparts. Even Chinese Huawei is threatening Japanese concerns.